8 Publishing will release (four) extended excerpts prior to the first limited hardcover printing of Hell Cometh in May 2011 as demand continues to increase more than anyone involved with the project had anticipated. Hell Cometh’s hardcover first edition limited print run will open up for presale in the coming weeks. Readers will be permitted to place their orders for copies of this very first limited edition hardcover print, which will be run once on Todd Card’s website at www.hellcometh.com while supplies last. The price for this first edition print will run significantly below the cost of other retailers, if purchased from Todd Card’s website. “Due to all the zombie enthusiast frenzy over this title’s release, Todd Card and 8 Publishing have worked out a deal to make Hell Cometh’s initial limited addition print run available to all readers signed by the author personally,” Richardson said. The mass-market hardcover edition will launch in May with this one-time online event, prior to paperback print releases of Hell Cometh going on sale through HellCometh.com, Amazon, Barnes & Noble and other retail distributors. The e-book versions of Hell Cometh will follow soon. ***An added bonus*** 8 Publishing will authorize the release of (four) extended excerpts to post on a secret page of HellCometh.com. 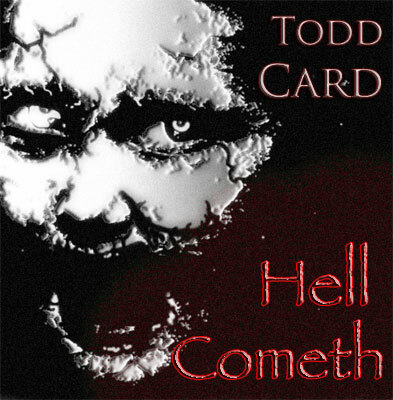 Each Saturday for the next four weeks, 8 Publishing will post a new five chronological page excerpt before the official general release date announcement of Todd Card’s horror novel Hell Cometh. Readers who are interested in experiencing each of the four hidden excerpts are invited to submit their name and email address below. Once their information is submitted, they will receive the unpublished URL address to enjoy each week’s new sample posting. *They will also be automatically entered to receive advanced notification of the official release date of Hell Cometh. *They will receive an exclusive presale link to reserve their limited first edition hardcover copy of Hell Cometh, signed by Todd Card. Each one of these books offered through this exclusive link will be available for purchase ahead of the general public, only while supplies last. *One lucky participant in this special promotional event will be chosen to receive a FREE limited first edition hardcover copy of Hell Cometh, signed by the author. 8 Publishing is a small, but growing, publisher of a wide variety of quality books. We help our writers bring their vision to market in the best possible light while treating each individual talent with the respect they deserve. This is the reason we only publish a few superior books each year. Instead of losing sight of each author's vision and treating them like an assessed earning potential, we work to ensure writers succeed in this digital age. One dream at a time. 8 Publishing feels this helps redefine the reader’s expectations with our final product. These authors include Todd Card, Arthur J. Michaels, Jennifer Leigh Richards, and more of the best new writers of their genres. Congratulations are in order to Card. He sounds like he has a fantastic book and he is willing to do whatever it takes to sell it. I think Mr. Card will do a fantastic job with his first book. 8 Publishing must be very happy about the deal.